Can't hear Johann Strauss' "Blue Danube"? The 64 Elite is due in the shops in mid April, the same time as this magazine. The version of the game reviewed was not quite finished, although Firebird assured us there would be no more significant changes. We were shown the game exclusively by Firebird's game-testing whizz kid Colin Fuidge who made a weekend trip to Yeovil guarding the precious pre-production disk. (Unfortunately two of the Zzap! team were away, but Chris Anderson and Bob Wade were able to give the game a thorough test, Bob continuing with the game late into the night.). One change you will notice on the finished version involves the text appearing on screen - the character set will be different. Firebird had not yet finished the new version which will feature computer style letters. Most text of the present article comes from the review published in the first issue of the British C64 magazine ZZAP!64 (May 1985). Typed by Alex Slater for his own site "Brigadoon", it is used here by permission. (I had to correct some minor errors caused by the OCR software, though). Hailed perhaps as the greatest ever computer game when it appeared on the Beeb last autumn, the great 3D space game now hits the 64. Our three-page review is the only one you'll see this month. Command your Cobra space ship in a fantastic voyage of discovery and adventure, a supreme test of your combat, navigational and entrepreneurial skills. Trade between countless planets, using the proceeds to equip your ship with heat-seeking missiles, beam lasers and other weapons - corporate states can be approached without risk, but unruly anarchies may be swarming with space pirates. Now, let's get into the time machine and go back to 1985! Firebird, £14.95 cass, £17.95 disk, joystick with keys or keys. 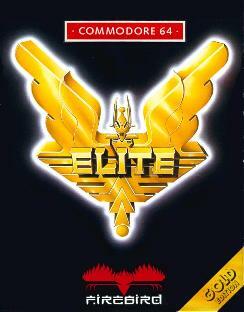 Elite is already a classic game on the BBC but its arrival on the 64 is a much more important event. Despite problems of conversion, the game has been improved and is still the same brilliant mixture of 3D space laser combat and trading. to the much sought after Elite. You begin your quest on the planet Lave in your Cobra Mk III spacecraft. You have one hundred credits with which to buy fuel and a cargo, but that won't buy much (you need to build up your finances very carefully on your early trips). Once your cargo is complete you're ready to find yourself a suitable destination and get into space where you can get familiarised with your ship and practise flying. Galactic Chart - total of 250 planets per galaxy. If you cut to the galactic chart screen you'll find yourself in the bottom left of galaxy one. There are eight galaxies in all and 250 planets in each one, so running out of planets is pretty hard to do. You can look at your position more closely on the local chart screen which shows the planets within about seven light years. This is the maximum range of your ship so many journeys will be needed to cross a galaxy. You can obtain data on any of the planets indicated on the local chart and target them for a hyperspace jump. Short range chart shows planets you can reach in one hyperspace jump. Launching your ship takes you out into a whole new world of planets, ships, space stations and asteroids. Ahead of you will be a planet (Lave) and if you use your rear viewer, you'll see the station behind. Left and right scans are also available so you can see everywhere but directly above and below you. I played this game for six hours at my first sitting and was only dragged away from it then by fatigue and wanting to tell everyone out there about it. It is a brilliant game of blasting and trading and is certainly the best game I've seen this year. The controls are terrific and aren't too responsive as on the BBC. The action is always absorbing and as for the size of the game, what can you say but that this is truly a mega-game. Once you do get involved in a fight there are several things to remember and numerous ways of killing and being killed. To start with you are equipped with a pulse laser and four missiles. Additional weapons you can buy are beam lasers, military lasers, energy bombs and mining lasers. You can also buy extra defensive equipment - an ECM system, fuel scoops, escape capsule, extra energy unit, docking computers and galactic hyperdrive. All of these can be bought at planets with the appropriate tech level. The most handy are military lasers which will blast virtually any ship with a couple of hits, an energy bomb which destroys every ship in your immediate vicinity and an ECM system which destroys incoming missiles. Lasers can be mounted on all four sides of the ship but you'll mostly use the front firing ones. All of these are very expensive though and will take a while to get, but once acquired they can be devastating. Even with such power the same basic combat rules apply, either kill your enemy by getting on his tail fast as possible before others arrive. Or if the odds look too great, try and run by making a hyperspace jump. Your Cobra is not the only ship blasting the space waves. Many other models exist but all are named after snakes and are dangerous. Anacondas, Boas and Pythons are all large cargo carrying vessels and if destroyed will leave an awful lot of space debris and hopefully some cargo canisters to scoop up (if you've got a scoop). Pirates, bounty hunters and mercenaries will use a wide range of ships including Asps, Cobras, Fer-de-Lances, Geckos, Kraits and Mambas. Most of these are flown by experienced pilots, have nearly as much speed as you and are heavily armed - so watch out. Most dangerous of all are Police Vipers and Thargoid invasion ships. Vipers are faster than you and will be encountered in large numbers if you have erred in any way, while Thargoids may appear with you out of hyperspace and swarm all over you, both resulting in rapid deaths unless you really are Elite. While you're near a space station take the time to get the feel of your ship and to understand the instrument display. Your controls are left and right roll, which spin you on your axis, and climb and dive which do just that. Zzzzap! Got him. Enemy ship hit by your twin lasers. The roll controls are tough at first but once mastered provide excellent movement - to actually bank left, you must first roll left and then pull joystick back to climb (or roll right and dive). You can use either a joystick or the keys. For flying though most 64 owners will feel more at home with the joystick. The instruments at the bottom of the screen indicate your forward and rear shield strength, fuel, cabin and laser temperature, altitude above a planet, number of missiles, speed, orientation and energy. The shields and energy are affected by hits on your ship and if you fire your own laser too much it will overheat and fire less rapidly. The most complicated instrument is the flight grid scanner which indicates where objects are around you and is vital in the middle of dogfights with other ships. It indicates whether a craft is above or below you and in front or behind you and whether it should be in view of your forward scanner. Trumble trouble. Thousands of cuddly creatures have taken over your craft and have started cluttering up your view. And the noise they make! Now you know your way around you can try a practice docking back at Lave. All you have to do is flip your ship over and head for the slit in the station side. This always faces towards the planer but you need to centre up carefully and slow down or you'll crash into the station or scrape your way down the docking entrance walls. When you feel ready, you can hyperspace to your chosen planet where you may have to fight pirates, bounty hunters or mercenaries all out to get your cargo or blast you for the sheer fun of it. You may be able to make a quick jump to the planet. If not there are other ships around and you had better be ready for a fight. Instruction screen for one of the special missions. Making it to the space station will bring a new set of market prices and hopefully a profit, that is if you've picked your planet and cargo properly. The game comes in an excellent package along with a very thorough and humorous instruction book, a quick reference guide to controls and ships, and a marvellous scene setting story called the Dark Wheel by Robert Holdstock. Here are the mega-brains behind the mega-game. 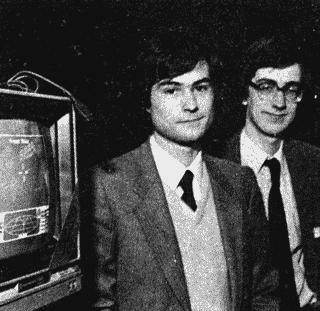 Ian Bell (left) and David Braben, both in their early twenties, must be two of the wealthiest guys around. They've been paid a fortune by Firebird for world-wide rights to the game - those in the know reckon it's a six-figure sum! BBC version by Acornsoft, who incidentally must be kicking themselves for not picking up worldwide rights at the same time. Ian and David have done the conversion to the 64 at the same time as studying for final exams at Jesus College, Cambridge where they both won scholarships. (Prince Edward is a fellow student there - wonder what his combat rating is?). It was David who first began programming Elite - and the machine he used? None other than the BBC's prehistoric ancestor, the Acorn Atom! List of local market prices. Your cargo bay only holds twenty tons, although for 400 credits you can buy a 35 ton bay. The most profitable forms of cargo are slaves, narcotics and firearms, but these are all illegal and trading in them will get you a rating of fugitive and bring the police onto your trail. You can remove this rating by trading in legal goods for a while but be warned, police Viper ships are lethal. Items don't always provide a good profit margin and you need to study the data on a planet before you travel there to determine the price you are likely to get for certain goods. Rich developed worlds will pay well for foodstuffs to support their high populations whereas undeveloped agricultural worlds will pay a king's ransom for technology. A deadly Police Viper fires acroos your bows. The nature of a planet's government should also determine how wise it is to go there since anarchies are likely to harbour a very nasty reception committee but democracies are easier places to stay alive. If you just remember to buy low and sell high you won't go far wrong, although bear in mind a pirate can smell a valuable cargo from light years away and you might have company very fast. The first thing to be said is that the game runs quite a bit more slowly on the 64 - this is caused by a combination of the fact that the central processor in the BBC runs at a higher speed, and that vector graphics are harder to program on the 64. However we don't think this detracts significantly from the game. In actual play the 64 graphics do not seem slow at all - you only notice the difference by running the two versions side by side. However if you've played the BBC version extensively, you'll probably find the 64 game has a different feel. There are more than enough improvements to compensate. For a start, all known bugs in the BBC game (and there are plenty) have been eliminated. Secondly, thanks to the 64's larger memory, the entire game is present in memory all the time, a considerable improvement on the BBC cassette version which had certain features trimmed. More important still, the 64 version contains some new features: there are extra 'special missions' that can occur if you prove yourself in battle. These are highly secret but we know that one of them is to track down a stolen ship which can only be destroyed with a military laser with repeated hits. The others you'll have to discover for yourself. Then, unique to the 64, there are the Trumbles. These cute little furry guys will reproduce on your ship to fill the cargo bay and also your ears with a cacophony of breeding squeaks. They could eventually stop you earning cargo and even start appearing on screen where the cute little bug-eyed bundles of fun may get in your way during a heavy battle or difficult docking. How you acquire them, and how you eventually get rid of them remain two of the universe's closely guarded secrets. Ones which only 64 owners can hope to uncover. 94% Marvellous booklets: informative, funny and convenient. 3D shoot-em-up and trader game, but what a brilliant combination. 91% Wonderful vector graphics showing great 3D action. From your first space flight you know this is a winner. 52% Laser blasts, crashing noises, hyperspace and docking sounds. 8 galaxies, 2000 planets, endless trading possibilities and tireless action. 95% Even at £14.95 it's a must. Note: Ullrich von Bassewitz's Elite128 is the closest thing there is to Elite II. An Elite fan's dream come true, it features so many enhancements that you won't believe it could be done without changing the game's single-load nature. I advise you to play the original before trying this, however, since this way you'll understand and appreciate Ullrich's work better -- and don't be fooled by the 'Elite128' title, the game is played on the C64. The reason for the '128' in the title is that, if played in the C64 mode of a C128, it can use the C128's 2MHZ processor to speed things up. You can read details about this fine work of programming expertise here!